Retired Army Capt. 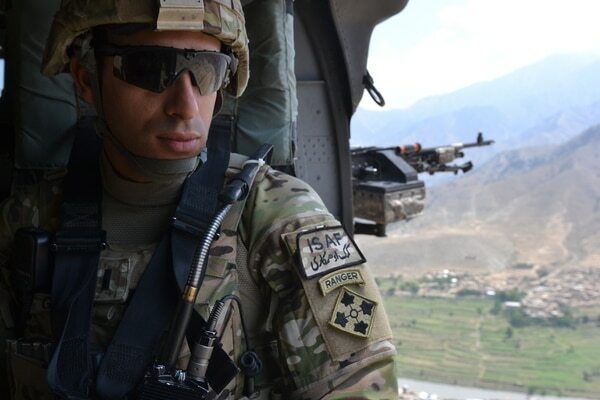 Florent Groberg will receive the Medal of Honor for saving several lives by tackling a suicide bomber during a dismounted patrol in Afghanistan on August 8, 2012. Photographed during an interview at the Pentagon in Arlington, Va., on Thursday, October 8, 2015. This story was originally published Oct. 11, 2015, at approximately 2:27 p.m.
Out of the corner of his eye, Capt. Florent Groberg saw the man first. "I'm looking at him, dark man-jams, he doesn't look right," Groberg said. 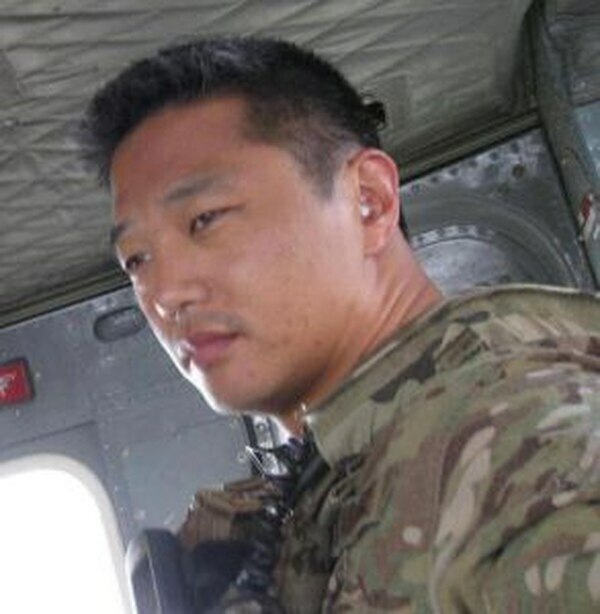 When the stranger turned toward the American patrol, the young captain, charged with his brigade commander's personal security detachment, quickly realized the man had a suicide bomb vest strapped to his chest. "The only thing I could think of was, 'I have to get him away. I have to get him away from the boss. I have to get him away from everybody,'" Groberg said. Groberg immediately started pushing the man away, throwing him to the ground. "The next thing you know, he just lands on the ground chest first, and I'm looking at him, and he detonates," Groberg said. "He detonated right in front of my feet." The blast killed four Americans and wounded several others. It also caused a second suicide bomber, who remained hidden behind a small structure near the road, to detonate his vest prematurely, according to information from the Army. Groberg's quick thinking prevented both bombers from detonating as planned, saving most of the people on the patrol. For his actions on that August 2012 morning in Afghanistan, Groberg will receive the Medal of Honor during a . The ceremony will take place Thursday Nov. 12 at the White House. He will be inducted into the Pentagon's Hall of Heroes on Friday. For more than 150 years, the Medal of Honor has been the U.S. military's highest award for acts of valor above and beyond the call of duty. Groberg, 32, is the 10th living service member to receive the nation's highest award for valor for actions in Afghanistan or Iraq. Seven troops have been posthumously awarded the medal for their actions in those wars. The infantry officer also is the third soldier from 4th Brigade Combat Team, 4th Infantry Division, based at Fort Carson, Colorado, to receive the Medal of Honor for actions in Afghanistan. Clinton Romesha and Ty Carter, both former staff sergeants, received the Medal of Honor in 2013 for their actions during the fierce October 2009 battle at Combat Outpost Keating in eastern Afghanistan. U.S. Army 1st. Lt. Florent A. Groberg, officer in charge for personal security detail, 4th Brigade Combat Team, 4th Infantry Division enjoys the view from a UH-60 Black Hawk helicopter traveling over the Kunar province July 16, 2012. Army 1st. Lt. Florent A. Groberg, officer in charge for personal security detail, 4th Brigade Combat Team, 4th Infantry Division, enjoys the view from a UH-60 Black Hawk helicopter traveling over the Kunar province July 16, 2012. President Obama called Groberg on Sept. 21 to tell him he would be receiving the Medal of Honor. "It was an honor to speak to the president on that day," Groberg said. "It is not every day that one of the most powerful and influential figures in the world calls your cellphone. I have tremendous respect for who the president is as a person, and I definitely will never forget the call." Still, Groberg, who was medically retired in July after seven years in the Army, said he's unsure how to feel about receiving the Medal of Honor. "It's one of those things where you're confused on the inside a little bit for how to feel about it," he said. "You're receiving an award for the worst day of your life, a day that you lost four incredible individuals, a day that I'll never forget, that lives on every day when you wake up." He finds it difficult to be congratulated for the award. "It's a weird feeling that's almost too hard to explain," he said. "It just reminds me of my guys that I lost." Groberg, who suffered severe wounds to his left leg, said his goal is to make sure others know about the four men who died that day: Command Sgt. Maj. Kevin J. Griffin, the brigade's senior enlisted soldier; Maj. Thomas E. Kennedy, the brigade's fire support coordinator; Air Force Maj. Walter D. Gray, of the 13th Air Support Operations Squadron; and Ragaei Abdelfattah, who was on his second voluntary tour with the U.S. Agency for International Development. "Four heroes, true heroes in this case, individuals who gave it all," Groberg said. "This medal belongs to them. It is my mission to tell everyone, 'Thank you for recognizing me, but this does not belong to me. It belongs to them.' That's how I'm coping with it mentally. This gives me an opportunity to represent them and their families." Soldiers from 4th BCT, 4th Infantry Division, led by then-Col. James Mingus and Griffin, deployed to eastern Afghanistan in February 2012. It was Groberg's second deployment to Afghanistan. Groberg was the officer in charge of the personal security detachment tasked with protecting Mingus and Griffin as they traveled across their area of operations to visit troops and meet with Afghan leaders. "Our job was pretty simple," said Groberg, who was allowed to pick his own team of six soldiers for the PSD. "We had 45 different outstations in Afghanistan in many different provinces, so I would come up with the schedule and fit in what [Mingus] wanted to do … and I would coordinate with the receiving units' security elements. It worked out really well until Aug. 8, 2012." On that morning, the soldiers left their headquarters in Jalalabad for a meeting with Fazlullah Wahidi, the provincial governor in Asadabad. There were 28 American and Afghan personnel in all, including two brigade commanders, two battalion commanders, two command sergeants major, an Afghan army commander and two U.S. civilians. "We landed at [Combat Outpost] Fiaz, which is adjacent to the governor's compound, around 9, 9:30 that morning," Groberg said. "From there, we dismounted the helicopters and conducted a foot patrol of 1,000 to 1,100 meters to the governor's compound." Everything about that morning "felt weird," Groberg said. "Just one of those feelings that you get in combat," he said. "You don't feel really comfortable about things, so I switched everything." Typically, the PSD would form a diamond around the principals, with Groberg in the back, he said. "In case something happens, you collapse on the principals, and you take them away from danger," he said. "I usually always, for six months, sat in the rear. I wanted the responsibility, in case something happened, to be the first one to grab the brigade commander and take him to safety." 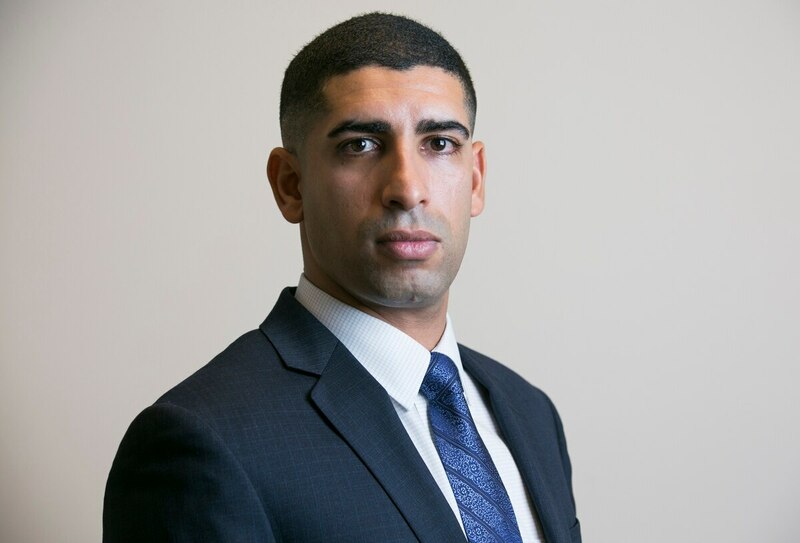 Army Captain Florent Groberg (ret.) tells the story of the actions that led to him being nominated for the Medal of Honor. On Aug. 8, "I just didn't feel comfortable, and I decided to have better eyes on, so I put myself at the spear of the diamond, so up front," Groberg said. The team medic, Spc. Daniel Balderrama, was on the right side of the diamond, and Pfc. Eric Ochart was in the back. "He's a big boy, Bears fan, love that kid," Groberg said. "I told him, 'Hey, listen, if anything happens today, doesn't matter what the brigade commander's rank is, you grab him, and you take him to safety. I don't care what he says to you, you're the colonel at that point.'" To Groberg's left was Sgt. Andrew Mahoney, the radiotelephone operator, while Sgt. 1st Class Brian Brink, the PSD's noncommissioned officer in charge, and Pfc. Benjamin Secor were placed even further up front. U.S. Army Sgt. 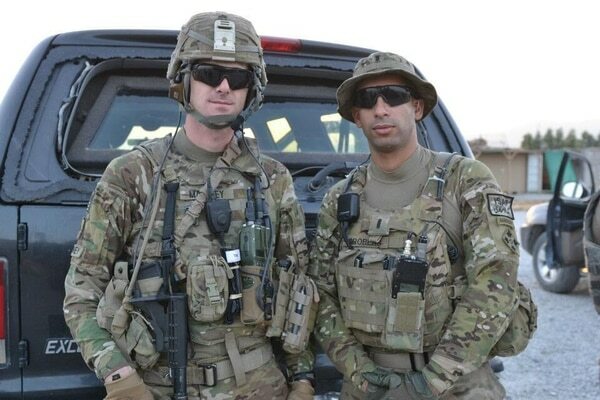 Andrew Mahoney (left) of Laingsburg, Mich., with 1st Lt. Florent A. Groberg (right) serving on a personal security detail with the 4th Infantry Brigade Combat Team, 4th Inf. Div., during a deployment to Regional Command-East, Afghanistan. 9. Florent and SGT Mahoney posing in front of a PSD vehicle in Nangarhar Province, Afghanistan in July 2012. Sgt. Andrew Mahoney (left) with then-1st Lt. Florent Groberg. They served together on a personal security detail with the 4th Infantry Brigade Combat Team, 4th Infantry Division. "This is when I told Command Sgt. Maj. Griffin, 'Please get into the diamond,' " Groberg said. "He said, 'No, no, no, you have too many people here. I'm a gun. I've been doing this for a long time, I know how to carry myself, and I know how to shoot, so I'm going to be in the rear.' So he stayed in the back with a couple other guys." With the Afghan soldiers leading the way, the patrol wound its way to the governor's compound. As the group approached a bridge, two motorcycles came speeding toward them. "The ANA did a heck of a good job pointing their weapons and screaming at them," Groberg said. "The guys dismounted their motorcycles and started running." That's when he first noticed the man walking backward, parallel to the patrol, Groberg said. "I felt and noticed there was a guy to my left, out of nowhere, I hadn't seen him," he said. "At that moment, I reacted to him, and I left my position and went at him." As he did, Mahoney followed. Groberg confronted the stranger and quickly noticed something on the man's chest. "I dropped my rifle … [and] I grabbed him by the chest and realized, at that point, 'Oh, he's got a suicide bomb on, he's got a bomb,'" Groberg said. In those short seconds, Groberg's only instincts were to move the man away from the group. "I started pushing him away, throwing him, and then Mahoney came and finished him off," he said. Groberg tackled the bomber to the ground. The explosion blew Groberg back 15 to 20 feet, knocking him unconscious. When he came to, he saw that his left leg had been mangled. "My fibula's out, I'm bleeding, muscle's melting, skin's melting, my foot's twisted," he said. Groberg took off his helmet and looked for his rifle. "I couldn't find my rifle, so I took my pistol out, and I made sure I had a round in there," he said. "I figured, all right, I must have stepped on an IED, because I couldn't remember anything. 'I must be in the kill zone, and they're probably going to follow up with small-arms fire.' "
Groberg knew he had to get to cover, so he started dragging himself across the dirt, pistol in hand. Through the cloud of dust, Groberg saw Brink running toward him "just like a movie," he said. Army Captain Florent Groberg (ret.) has met family members of those who died in Afghanistan in the attack that led to him being nominated for the Medal of Honor. The NCO grabbed Groberg and pulled him to a nearby ditch, where Balderrama started treating him. "I kept saying, 'Save my leg, doc, save my leg,'" Groberg said. "I was so tired, then I was so thirsty." Despite his wounds, Groberg demanded to know the status of the men he was charged with protecting. When he saw the four men who had been killed, "I will never forget seeing them laying out there," he said. It wasn't until his men loaded him into a truck to be evacuated did Groberg first feel pain. "It felt like someone had a blowtorch and was burning my leg," he said. Groberg spent almost three years at Walter Reed National Military Medical Center, enduring more than 30 surgeries. The explosion had destroyed almost 50 percent of Groberg's left calf muscle and damaged much of his lower leg. He also had a blown eardrum and a mild traumatic brain injury. "I took an injury that cost about 45 to 50 percent of my calf, it made my leg below my knee numb, I can't feel my toes, they tied all my ligaments together, fused my foot," he said. "I am lucky to be standing and be able to do this today because of the incredible care that I received at Walter Reed." Today, his leg is still sore — always. Groberg wears a brace most of the time, "but it's really, really good," he said. "I can't complain." The injury did derail his plans for an Army career, however. "It would have been almost impossible to stay infantry, and I wanted to go into the Ranger battalion," Groberg said. "Unfortunately, I can't run anymore, and rucking, after a couple miles, it just doesn't work out, so I wouldn't have made it, and if I had made it, I think I would've been a liability in combat situations." So now Groberg is looking for a different way to serve, most likely as a civilian in the Defense Department. "I'm still trying to figure it out, how I can make a difference," he said. Looking back on that dreadful day, Groberg said he didn't have time to think before reacting. Retired Army Captain Florent Groberg describes his feelings after hearing he would receive the Medal of Honor. "Everything happened in 30 seconds," he said. "In 30 seconds, all our lives changed, the entire team, and not just the team, but the families." Groberg downplayed his actions, calling them "instincts" and crediting his team for their actions. "I'm not thinking, 'This is it,' " he said. "I'm thinking, 'I have to get this guy away.' My entire team, at that point, it's 100 percent a team effort. Everybody clicked, everybody knew what to do with their mission, the training kicked in." Everybody that day did their job "and we still lost four individuals," he said. 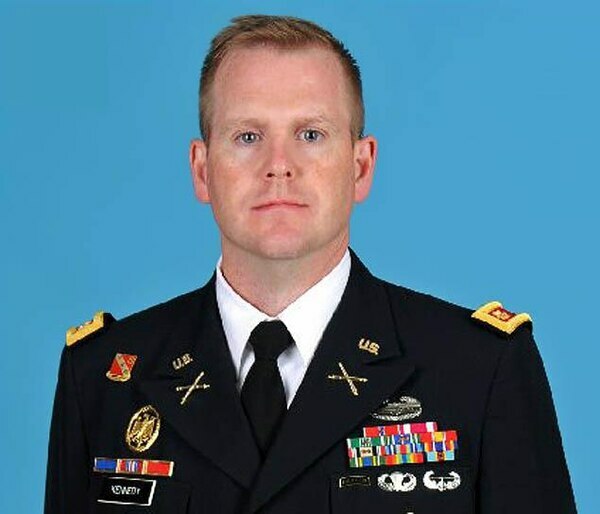 Mahoney, who suffered a severe soft-tissue wound to his left forearm and shrapnel wounds to his right shoulder and right leg, would go on to earn the Silver Star, the nation's third-highest award for valor. At the award ceremony, Brink gave each member of the team a bracelet commemorating the three military men who died in the attack. Groberg wears it on his right wrist. "I made a promise to myself that I would live my life to the best of my ability," he said. "I no longer live for myself, but I live for these guys as well. Every one of the guys on my team was given one of these. It's our connection to each other and our connection to the guys we lost." Since the attack, Groberg has returned to Fort Carson and met with the families of the fallen. He has built a friendship with Pamela Griffin, Kevin Griffin's wife. "I have talked to her a lot about what Command Sgt. 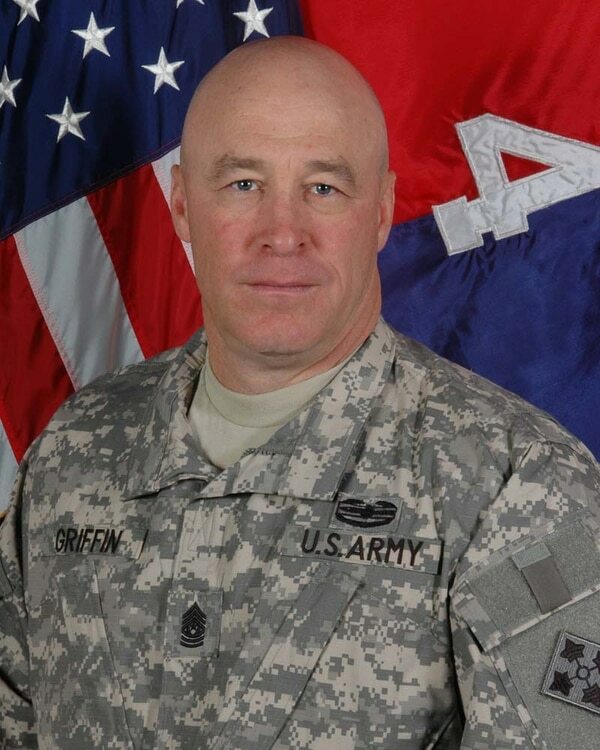 Maj. Griffin meant to me," he said. "This is a man that I used to spend hours in his office. We were both Bears fans, we were both athletes in college, just so much in common. Anytime I had a question about something I was unsure of, military-wise, I knew I could walk into his office and he's talk to me. You're talking about the command sergeant major for an entire brigade, but he always had time." Groberg also has met with Gray's wife, Heather, and belatedly learned how many people respected and loved Kennedy. U.S. Army Cpt. 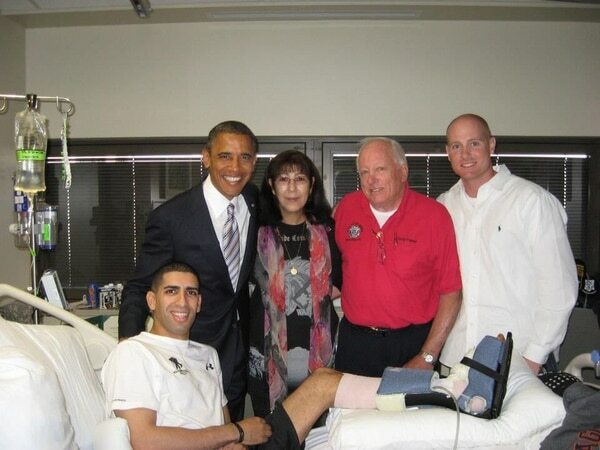 Florent Groberg with his mother, Klara, and father, Larry, and friend, Matthew Sanders, at Walter Reed National Medical Center with President Barack Obama on September 11, 2012. Capt. Florent Groberg with his mother, Klara, and father, Larry, and friend, Matthew Sanders, at Walter Reed National Medical Center with President Obama on Sept. 11, 2012. And while he didn't really know Abdelfattah well, Groberg met his wife and two sons during a State Department ceremony to honor the man. "Two tough kids right there, you can see the strength they learned and took from their father," Groberg said. "They just stood up tall when everybody was talking about their father, who's gone." These meetings and connections are why Groberg said he is focused on ensuring the memory of the fallen remains alive. "This is not about me," he said. "I'm here talking to you, and I'm here breathing, and I'm here able to keep watching football on Sunday, [but] they're not, and their families have to live with that. I want to honor them the best way that I can, and hopefully live my life the best way, but I want everybody to know what incredible people these guys were and what their families are going through."